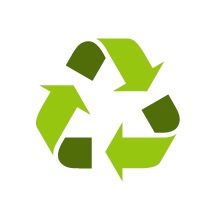 The Recycling Symbol is a world wide known symbol and it is used to designate recyclable materials. It consists of three symbolic arrows forming a continuous loop. 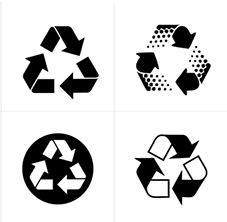 The universal Recycling Symbol was developed in conjunction with the first "Earth Day" in 1970 by "Container Corporation of America," a major producer of recycled paperboard who sponsored a design competition for eco-conscious art and design students across the United States. It was announced that they would create a design that symbolized the paper recycling process. The race was won by the 23-year-old college student Gary Anderson at University of Southern California. The Recycling Symbol is not registered as a trademark and can therefore be used by anyone. Countless variants of the design are all over the world but use is regulated by law in some places.